The mining town of Chiatura is an integral part of the global history of industrialisation and is unique in its conception and implementation. The discovery of manganese ore in the Chiatura area by the German geologist Wilhelm Herman von Abich in the 19th century led to the foundation of the town. The increase of steel production in Western Europe and USA resulted in a high demand for Chiatura’s manganese and the increased export of the material. Eventually, manganese from Chiatura accounted for 50% of the world’s total supply by 1913. The booming mining industry led to the creation of a unique cargo and civic cableway network in Chiatura. The development of Georgian cableway engineering followed contemporary European trends and, through intensive exchange, has made Chiatura a regional scientific hub for cableway construction. Chiatura’s aerial cableway network includes 18 passenger and 27 cargo cableways. The stations are scattered along the river gorge connecting it to the districts. The network is striking in its diversity of architectural styles and of engineering solutions from small sheds to sophisticated pieces of architecture, which form urban landmarks in the town. The absolute majority of cableways retain original technological and architectural components. Cableway stations are built in Socialist-Realist, Modernist and Brutalist styles. One of the oldest Chiatura cableways, the “Perevisa-Town”, and some buildings are listed as historic monuments. Due to the lack of maintenance over the last few decades, many of the passenger cableways have deteriorated and have eventually been closed down. Few of the cargo cableways function today, due to the decrease of industry, but also due to their poor physical condition. The majority of cableways are owned and operated by the private mining corporation LLC “Georgian Manganese” and the municipal administration. Few of the passenger cableways remain under management of the municipal administration. In response to safety warnings, the local government discontinued operation of the four lines under its management and their replacement with modern ones is ongoing. The LLC “Georgian Manganese” has implemented relatively small scale repair and maintenance works. Due to the poor condition of the station buildings and the technological components, the common approach is to close down and abandon the cableways. Replacing the cableways is less common due to the high cost. This important site of industrial heritage benefits from the positive support of the local and national institutions, including the nominator, the Ministry of Culture and Monuments Protection of Georgia. In the last couple of years, the European Union and the Council of Europe have supported several studies on heritage led urban development of Chiatura in the context of COMUS, a joint programme on Community-led Urban Strategies in Historic Towns (2015-2017), as well as Kyiv Initiative Regional Programme (2009-2011). 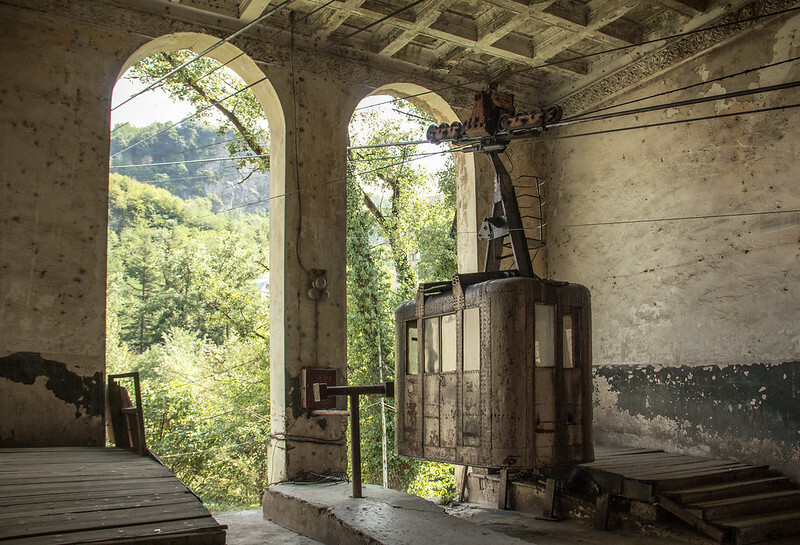 This has included a feasibility study in 2017 on the rehabilitation of one of the oldest Chiatura cableways, the “Perevisa-Town”. However, funding seems to be lacking, which in turn threatens any sort of viable future for the Chiatura cableway network.